The electric chair sequence in Angels with Dirty Faces (1938) is one of the most famous scenes in old Hollywood films. Above, James Cagney (center left) walks the last mile with Pat O'Brien. We'll break down the scene -- and what makes it work -- below. The Key Players: Director Michael Curtiz and stars James Cagney and Pat O'Brien. 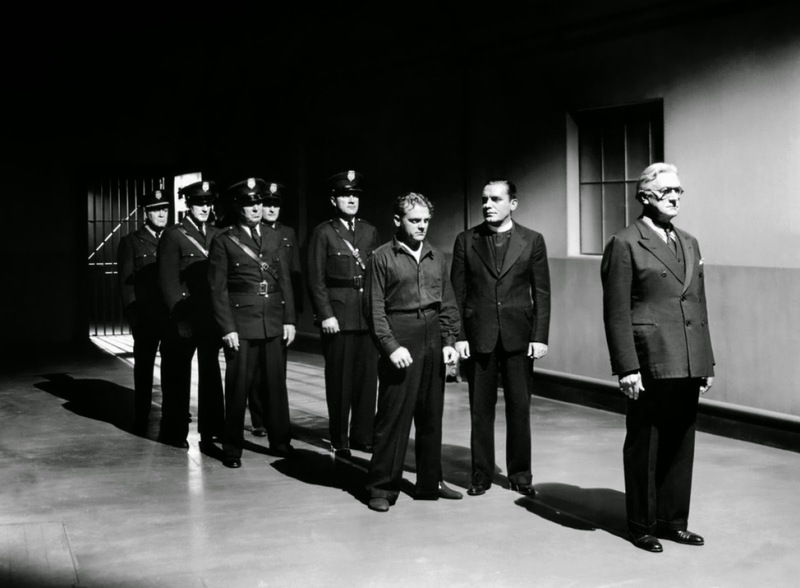 The Set-Up: Gangster Rocky Sullivan (Cagney) has to face the music after killing a police officer in a shoot-out. He is accompanied to the electric chair by his childhood friend, Catholic Priest Jerry Connolly. In the previous scene, Connolly urged Rocky to feign cowardice at the time of his death to deter a group of teenagers (the Dead End Kids) from following Rocky into a life of crime. 1. Cagney's performance: I've said this before, but Cagney and Charles Laughton are for me the two greatest screen actors of the thirties. Cagney's performance throughout the rest of the film is exceptional -- he modeled Rocky's twitchy mannerisms and "Whaddya hear? Whaddya say?" catchphrase on a small-time hood he knew while growing up in New York's Lower East Side. However, Cagney took the performance to a whole new level in the electric chair sequence. It's one of the scenes he will always be remembered for and I think he knew that before filming began. He threw himself into the scene with his characteristic dedication, losing four pound in the process. 2. Curtiz' direction: Curtiz probably has the most impressive filmography of any old Hollywood director; after all, he made three classic films in 1938 alone (Angels with Dirty Faces, The Adventures of Robin Hood, Four Daughters), although he isn't as widely known as Alfred Hitchcock and John Ford because he wasn't the master of one particular genre. Curtiz usually wasn't a showy director -- his MO for the most of Angels with Dirty Faces is point the camera at Cagney, which is actually a very shrewd decision -- but the electric chair sequence is a masterpiece of the director's art, fully the equal of anything in Hitchcock or Ford's body of work. The close-up of Cagney's defiant face (it's the last time we actually see him on screen) followed by his harrowing screams while the rest of the scene plays in shadows is the perfect way to stage a difficult and demanding scene. Cagney famously wanted the sequence to be ambiguous, allowing the audience to make up its mind on whether or not Rocky turned "yellow" at the end, but it is Curtiz' direction that really puts this across to the audience. 3. The underlying message: Forgot O'Brien's pious platitudes (although he gives a fine performance in this scene) the real message of Angels with Dirty Faces is that a random twist of fate can change the course of a person's life. Rocky becomes a criminal by happenstance. He and Connolly rob a train car as boys and while Connolly gets away, Rocky is caught and begins a life in juvenile detention that will lead to his march to the electric chair. Connolly acknowledges as much in the final scene when he asks the Dead End Kids to "pray for a boy who couldn't run as fast as I could."